Waikoloa Beach Villa with Private Poolside Location, 3 Bedrooms w/Waikoloa Golf Membership Benefits & More! This poolside/ volcanic mountain view three bedroom townhome is surrounded by the most enchanting scenery. Ideally located away from the main traffic area of the complex, your sure to enjoy the views of the spacious green belt area off your lanai. You are steps away from the swimming pool, hot tub, and the on-site fitness room. 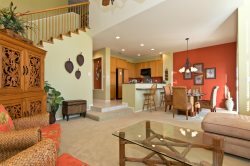 Designed to suit all occasions from entertaining guests to relaxing after a fun day’s adventure, this townhome is sure to please. The indoors and outdoors merge to become one spacious living area and has recently been updated with new paint, carpet and upholstery. Relaxing on the lanai while you grill on your own private BBQ and watching the afterglow sunset is the perfect space you’ll want to be with friends and family. The entire lower level has tile flooring thru the living rooms, dining room and kitchen, and there is a guest bathroom and bedroom with a comfy queen-sized bed. The gourmet kitchen comes fully-equipped with high-end appliances, a breakfast bar with seats for five and the dining area with seats six. The upper level features an large master suite with a king-sized bed, quality linens, flat screen TV, and a large lanai to soak up the afternoon sun. Also, central to the upper level is a loft area with sleeper sofa and large flat panel TV, washer and dryer, and a second bedroom with two twin beds with an en-suite bathroom with tub/shower. This unit comes with plenty of beach gear like chairs, boogie boards, cooler and umbrella as well as beach towels for your use. Waikoloa Beach Villas A1 includes Waikoloa Beach Resort Gold Membership Golf benefits (discounted tee fees at the Waikoloa Beach Resort Courses). Fees are $50.00 per person, per round at the Kings Course and $75.00 per person, per round at the Beach Course. Instructions for using this privilege will be sent after reservation is confirmed.